Diva 2 'where backpackers meet' is a budget hostel for backpackers who are looking for affordable and clean rooms in a great location and with charming atmosphere. On 3rd floor you can chill at our breezy panorama roof-top with enough tables, chairs and hammock, overlooking parts of the city with beautiful views to the mountain range. Meet new friends, read, play cards, practice yoga or lay in the hammock and relax with a drink. Our in-house Travel Agency and info-center offers a combined 23 years of honest travel services and advice. Experience and explore with us all the adventures and the beauty that the North of Thailand has to offer. 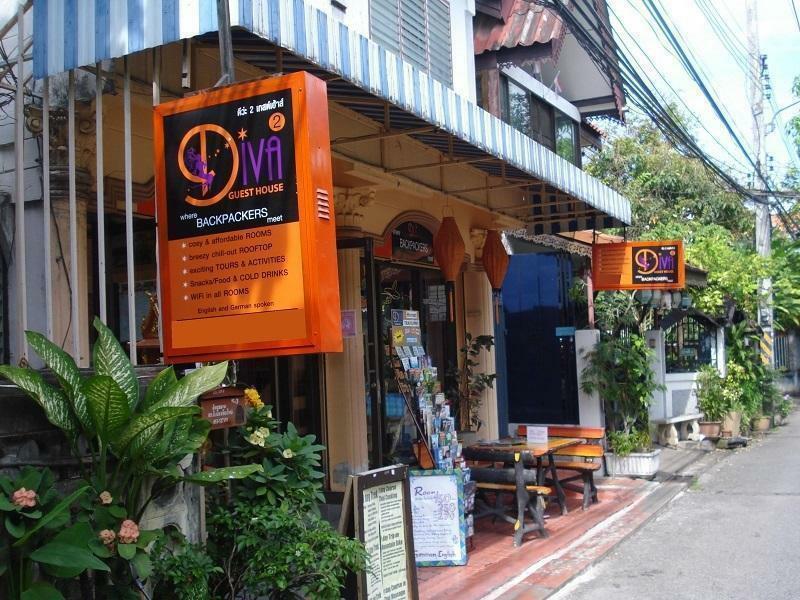 Diva 2 is located in a quiet lane within the liveliest and colorful backpacker area with small lanes dotted with restaurants, pubs, cafes, live-music venues, bakeries, food market, street food vendors a.s.o. We offer functional equipped rooms with bathroom en-suite either cold or hot showers, fan, and small closet. Free Wi-Fi is available throughout the building and rooms. All rooms are painted colorfully and feature some art. Linen, blankets, pillows and towels are provided as well and rooms are cleaned as per request. Cold and hot drinks at reasonable prices are available to enjoy at our small outdoor sitting area or on our big panorama roof-top. The property is located in the north-eastern corner inside the Old City behind the Somphet Fresh Food Market, close to the oldest temple in Chiang Mai, the Wat Chiang Man, and just 3min away from Wat Lam Chang. It offers functional equipped rooms with fan, small closet and comfortable beds with spring mattresses. Free Wi-Fi is available and all rooms come with colorful painting, a western toilet and hot shower. Linen, blankets, pillows and towels are provided as well as cold and hot drinks at reasonable prices. On the third floor you can chill at our breezy panorama roof-top, overlooking the Old City with beautiful views towards Wat Doi Suthep on Doi Pui Mountain. Meet new friends while discussing your travel plans, playing cards, practicing yoga or just having a drink. The property provides the All-In-One Base for you to experience and explore all the adventures and the beauty that the North of Thailand has to offer. Our In-House Travel Agency offers a combined experience of almost 23 years of honest travel services and advices. About 4 km from the Airport (Airport-Taxi 120baht), 5km away from the Arcade Bus-Terminal and the Train Station (Tuk-Tuk 80-100baht or Red pick-up taxis 40-60baht) it takes only about 20min to reach us.